As consumers, we’re only accustomed to seeing the outcome of every business process. From the goods purchased from supermarkets to the clothes that end up in our clothing racks, companies in the manufacturing business ensure that every product they produce is of top quality for the consumer market to enjoy. But oftentimes, it’s what happens behind the scenes that has many managers working around the clock. 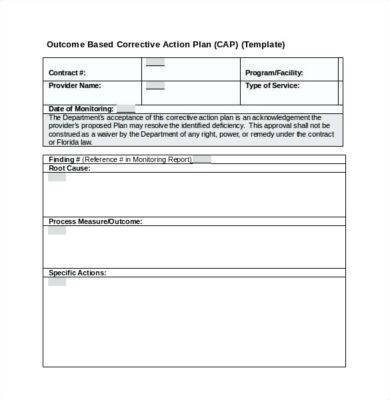 You may also see business action plan examples. Every business has its own set of problems. Human errors and machine errors are often inevitable, which is why a business must strive to find ways to resolve these problems before they completely affect the rest of the company’s operations. As a response to these complex situations, the company must have a well-defined corrective action plan in place. Every business, regardless of the industry it is a part of, should have a simple action plan ready to execute the different strategies proposed. An action plan contains a sequence of steps that must be followed, or a series of activities that must be performed in order for a strategy to succeed. Generally, a good action plan must have three primary elements: a specific list of tasks to be carried out (and by whom), a time schedule, and a resource allocation that indicates the intended funds for a specific activity. Action planning is an intensive process that requires a stern amount of focus and commitment to generate wise ideas, along with the steps needed to achieve a particular professional goal. This provides you with a concrete timetable and a set of clearly-defined steps to help you obtain your desired objectives effectively. Without an action plan, one’s attention would be overly fixated on the end goal and not on the direction being taken. This can then lead to a great amount of loss in time, money, and other resources that may cause the business to fail completely. 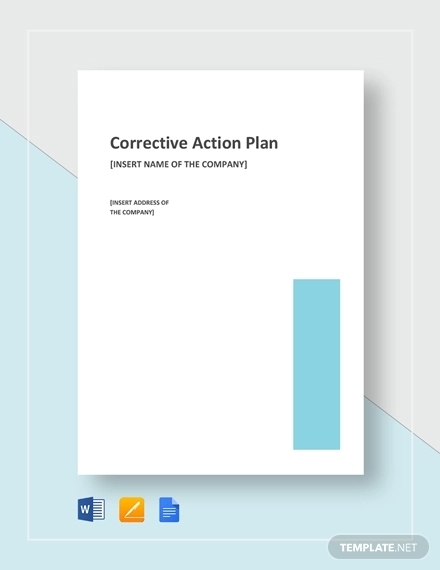 A corrective action plan is an important document that describes how a specific situation may be improved in order to meet the goals of a company. Despite the management’s constant efforts to create an effective business plan, problems are bound to occur nonetheless. This is why the company must implement the necessary changes to overcome such issues as soon as possible. And if you happen to have stumbled upon this article, then it’s likely that a problem does exist. Perhaps your company has received multiple customer complaints in the past week over a newly released product. Or, your business has experienced issues with your marketing budget in the previous month that must be resolved in order to make up for the succeeding month. In any problematic circumstance, there are people, processes, and actions required to straighten out these issues. 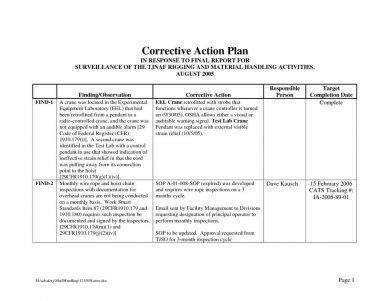 Here, the corrective action plan will be used to prevent these setbacks from happening again. When it comes to solving problems in the world of business, identifying the root cause of such issues is a vital step that must be prioritized. However, tracing the exact cause of a problem can be quite difficult, as a mistake in this process could potentially lead to a significant loss in both time and resources. You may also see sales action plan examples. But what happens when you do pinpoint the source of the issue? Corrective action must only be taken in the presence of a specified problem. And in case a problem does in fact exist, then these actions should be linked to to a relevant area of a compliance record in order to translate the whole context of the said problem. For instance, a corrective action may be linked to the company’s audit results, safety incidents, or customer complaints. 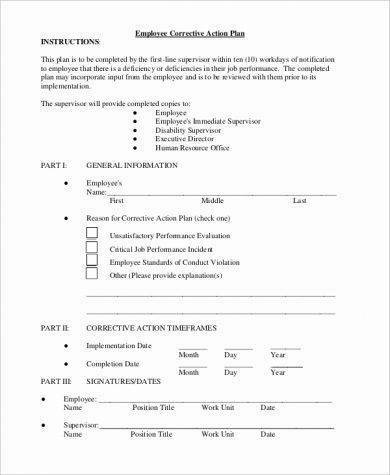 You may also like employee action plan examples. 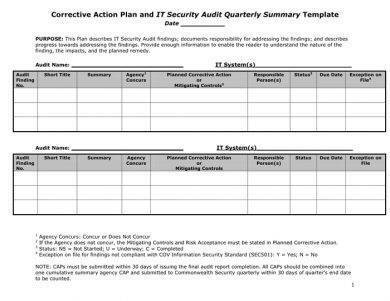 If necessary, you may also use an integrated Quality Management System to draw these functions together for you to create a clear and transparent compliance record. Once you have identified the underlying factors that have caused a problem, you must then determine the action items that are aimed at addressing the issues at hand. Since it’s impossible to fix a huge and complicated problem with a quick snap of a finger, it’s important to break these action items down into smaller, more manageable parts. 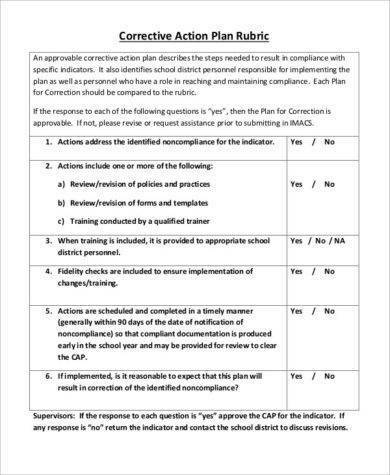 You may also check out what is an action plan. You may also include additional details where needed to make it easier for a person to understand what he or she needs to get done. 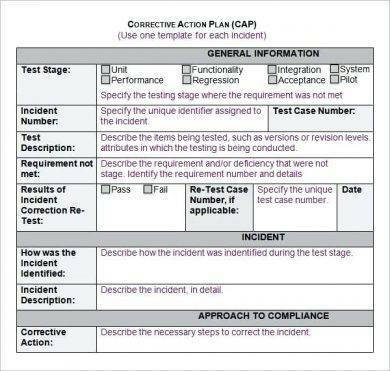 This could be a photo of the incident record that illustrates the issue and its solution, the essential conditions for closure, or even a list of instructions that present the necessary updates that need to be made on an existing program or process. You might be interested in marketing action plan examples. 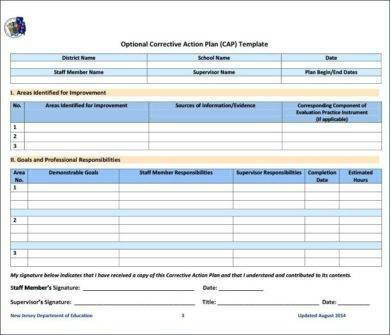 Once the initial part of the simple plan has been made, you must then draw out a workflow to execute the corrective action. But since the action plan may require the participation of multiple individuals, the circumstance at hand may be vulnerable to other potential risks. To prevent this from happening, the need to create a robust corrective action plan is considerably high. This is why the management must formulate distinctive workflows for various corrective action types to better standardize the entire process. Strict due dates that comply to internal business rules must also be observed to ensure that tasks are accomplished without further delays. A flow chart that illustrates the step-by-step process of the plan may also be constructed to use as reference. When running a business, assigning the right people to handle certain sectors of the company is highly advisable. You wouldn’t want just about anyone to manage serious business operations, would you? For this reason, assigning a responsible party whom you think is fully capable of streamlining the plan is an essential part of any successful corrective action plan. This way, deliverables may be scheduled according to one’s role, and a protocol may be followed to monitor staff members and their respective workloads. In the absence of a certain member of the team, the entire staff should be flexible enough to keep things on general schedule. Risks can be hard to avoid, especially when there’s always a chance that a proposed action would not turn out as expected due to some factors that the team has failed to identify. But when it comes to determining what corrective action request to prioritize, the company must consider the severeness of the situation at hand. You may also see job plan examples & samples. Conducting a risk assessment procedure can help you analyze the critical level of each case. Calculating a risk based on an internally-developed risk matrix will allow you to filter out the most high-risk issues that must be attended to immediately. This will help you resolve a problem before it has the chance to leave even a bigger damage to the company’s operations. 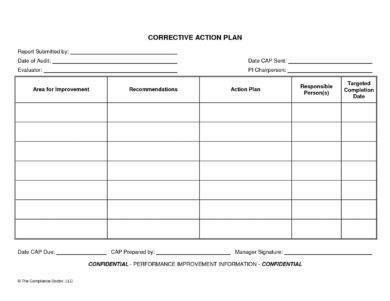 To write a good corrective action plan, managers must take the appropriate measures required to create one. This should properly communicate the different activities and roles that staff members must comprehend in order to perform their jobs effectively. You may also see research action plan examples. What is happening? How is this affecting the company? What can be done to fix this problem? You must clearly state the weaknesses or problems that are currently being faced. The root cause of the issue must also be explained in a clear and concise manner to make it a lot easier for readers to grasp. 2. Make a list of the individuals responsible for the results. Gather a team of respectable individuals who possess the skills needed to perform various actions. If applicable, you can also specify how these individuals may be trained to carry out their respective duties. Remember to assign a manager or a team leader to monitor progress and handle potential issues or problems that have been reported as well. 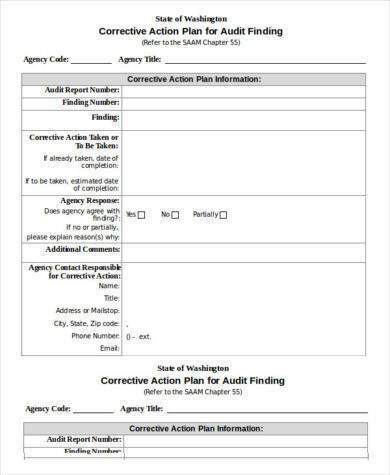 You may also like teacher action plan examples. Whatever you do, do not overthink a problem. People who see things bigger than they actually are tend to respond negatively to a situation. Keep in mind that a major problem can be settled through the use of a simple and measurable solution. You may also check out advertising plan examples. To do so, make sure to study the root cause of a problem before implementing an action. Determine if an action is reasonable enough to accomplish, what requirements need to be met, along with the resources needed to conduct the plan. 4. Assign the individuals accountable for each solution. Though most executives hold the head of a team accountable for the entire team’s performance, in some cases, the manager of the entire sector may also be held responsible for the whole procedure. This may depend on the managerial hierarchy observed within the company. You might be interested in personal plan examples. So to create an internal structure, decide whether one person would be solely accountable for a solution, if the responsibility would be shared, or if there would be a segregation of duties to properly distribute each task. Not only will this build an orderly process, but this will also make it easier to track activities for better management. Always set a reasonable time frame for each activity. The longer you wait, the more susceptible the plan becomes. It’s almost like an open wound that’s waiting to be healed. If you continue to leave the cut as is without taking the necessary medications, then this could lead to a severe infection that will make the problem even more complicated than it was before. You may also see development plan examples. 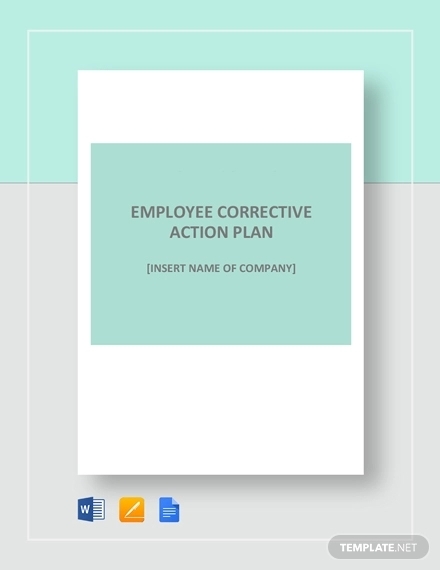 Corrective action is a crucial aspect of resolving unfavorable events within the organization. 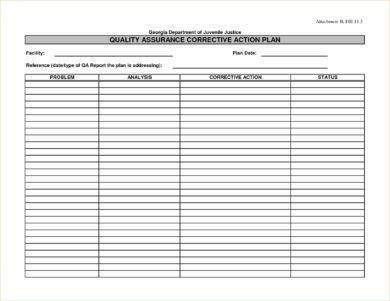 The processes involved in the corrective action plan are developed to prevent these problems from occurring again. But like every other action plan, this must be created with careful research and simple analysis in order to build clear-cut solutions for the benefit of the company and its workforce. With the knowledge acquired from this article, your company can survive even the toughest situations with ease.